Sarah lives in a run-down apartment, has a car that is on its last legs, and is trying to pay off the bills from her father's death. Her boyfriend of a year and a half, Matt, is good to her, but she is focused on her career right now and trying to improve her lot in life. Finally, it looks like her luck might be turning. Under the tutelage of her mentor Megan, she is up for a huge promotion at work to take over for the hugely pregnant Audrey who most likely won't be returning. It goes without saying that this is not a job geared for someone with a young child. Yes, all is going great until Sarah realizes her constant sick stomach isn't due to the flu. When she realizes she is pregnant, she has a huge decision to make. If she keeps the baby, she will lose her promotion and has no idea how she will support the child. Everyone at work, except for Audrey, tells her to abort, but will she be able to live with herself. Complicating matters is her strained relationship with God and her mother's mental instability. Sarah's Choice deals well with the fear that a young woman can experience with an unplanned pregnancy. It is very pro-life, pro-family Christian fiction with a storyline that will keep you reading. I was reading the June/July 2014 issue of Working Mother magazine and came across an article on Maria Deppapina, founder of Specs4Us, glasses designed especially for those with Down Syndrome. Because their faces are shaped differently, traditional styles of glasses can be very uncomfortable as well as not provide proper eyesight correction. According to the article, "87 percent of kids with Down's need glasses." Dellapina, the mother of a teenage girl with Down's, "designed frames with a lower bridge and temples, wider end pieces to compensate for wider faces and shorter ear pieces that don't hang back over the ears." After losing her job because she needed medical time off to care for her daughter, Dellapina decided to start a company to create these glasses. For more information, please visit http://specs4us.com/ and please help spread the word. As someone who has worn thick glasses most of my life, I can testify to how important it is to be able to see correctly through them and have them be comfortable. This could really make a difference in a child's life. Dr. Bert Ghezzi, well-known Catholic author of several books on the saints and the sacraments, has now written a book about how Catholics live. The Heart of Catholicism: Practicing the Everyday Habits that Shape Us “is a book about what Catholics do and why they do it. 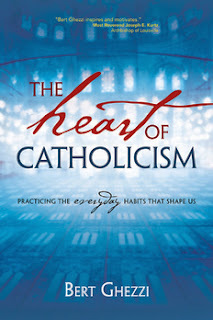 It describes the practices and spiritual disciples that shape a Catholic’s daily life.” It is designed to be a how-to guide for new Catholics, and a refresher course for the rest of us. Each of us has her own unique family situation. When we compare ourselves to other homeschooling moms, it my seem as if we're all the same, but we're not! Each mom is special, fearfully and wonderfully created by God. Yet, we want to fit in a box with someone else. If you want to find similarities, use this instead: remember that every mom homeschools because she loves her children and because she wants to be with her children. We will each demonstrate that love differently, but it's still love. Likewise, we will each homeschool differently, but our motives are the same: we love our children. That is our common ground. I attended Elms College for four years and worked there for another six and yet I never set foot in the Archives Room. It was this locked room in the library that was most definitely off limits. There was a very intimidating sign that said "By Appointment Only" and I never had the nerve to ask for an appointment. After all, what reason could I give? 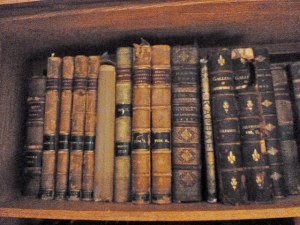 I'd really like to touch (and smell) the old books? Somehow, I think that might have been frowned upon. Seriously though - I had no idea what treasures might be there. I thought it contained old yearbooks and college memorabilia but beyond that, my imagination failed me. Turns out, there are many interesting books and documents to be found there. The most recent issue of the alumni magazine features an article about efforts to digitize the collection. Even the librarians who are in charge of this effort are being surprised daily by what is being found. There are materials dating back to the 1400s and 1500s. As a history major and book lover, I am so excited by this! Library Director Anthony Fonseca shares, some of the library's collections are extremely rare, "one of a kinf, or one of only five copies in the world, or the only copy of this side of the Atlantic." The goal is to finish digitizing the collection in the next five years. To see what is available so far, please visit The Elm Tree. The gift of knowledge, 'scientia', that “is not limited to human knowledge, but which through creation leads us to perceive the greatness of God and His love for His creatures” was the theme of the Pope's catechesis during this Wednesday's general audience. In the presence of more than 50,000 people in St. Peter's Square, Francis explained that this gift of the Holy Spirit also enables us to discover how the beauty and immensity of the cosmos speaks to us of the Creator and invites us to praise Him “from the depths of our heart and to recognise that all that we have, and all that we are. is an inestimable gift of God and a sign of His infinite love for us”. 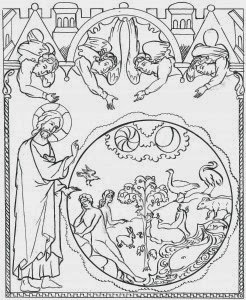 In the first chapter of Genesis, at the very beginning of the Bible, it is made clear that God is pleased with His creation, and the beauty and goodness of everything is repeatedly emphasised. If God sees that creation is good and beautiful, then we too should assume this attitude. … And when God finished creating man, He did not say that what he saw was good, but rather that it was 'very good'. In the eyes of God we are the most beautiful, the greatest, the best of His creation: even the angels were beneath us, we are greater than the angels. The Lord loves us, and we should thank Him for this. … The gift of knowledge places us in profound harmony with the Creator and allows us to participate in the clarity of his vision and judgement. And it is from this perspective that we are able to perceive in man and woman the peak of His creation, as the fulfilment of a plan of love that is inherent in each one of us, and enables us to recognise each other as brothers and sisters”. The Pope returned to the first risk, that of seeking to appropriate creation instead of protecting it. Creation is “a gift from God to us … and when we exploit it, we destroy the sign of His love. Destroying creation is like saying to God, 'I don't like it', and this is not good, it is a sin. Care for creation is care for God's gift to us, and it means saying to God, 'thank you, I am the custodian of creation, but to enable it to progress, never to destroy your gift'”. “This should make us think, and to ask the Holy Spirit for the gift of knowledge to understand well that creation is God's most beautiful gift. He has made so many good things for the greatest creation of all, the human person”. The May 2014 issue of Columbia Magazine featured an article about the Holy Spirit Council 11922 of the Knights of Columbus and their mission to supply A Woman's Choice Pregnancy Resource Center in Falls Church, VA with cribs for anyone who needs one for her baby. A woman had come to A Woman's Choice after having an abortion. When asked why, the woman said, "Because I don't even have a crib for the baby I already have." The council decided to take action. A pro-life program called "Project Manger" was born with the goal of making sure that no child is ever aborted for lack of a bed. Sometimes, it is the most practical of things that can make a huge difference in whether a mother feels she can carry her baby and provide for his or her welfare. Please support your local pregnancy center however you are able. It can mean the difference between life and death for an unborn child. 1. Their inner beauty blossoms because of God's love. 2. They plant seeds of kindness every day. 3. Their loving ways nurture others. 4. Their lives grow richer through the grace of God. 5. They brighten the world by their example. May we all strive to be women of faith! Are you a quilter with too many quilts on her hands? Or do you have ideas for quilts you'd like to make, but no one to give them to? Donating quilts is a wonderful solution. Project Linus donates blankets to children who are seriously ill or traumatized. Quilts of Valor provides quilts to servicemen and servicewomen and veterans. Wrap them in Love collects donated quilts and distribute them to children around the world, so they can be wrapped in love and comfort. The lives of saints cannot be understood unless seen as works of art, as poems. They can only be understood as songs of praise to God. Emily Dickinson wrote, "If I feel physically as if the top of my head were taken off, I know that is poetry." The saints lives should make us feel the same. When you read about a saint, or if you are lucky enough to meet one or watch him or her in action, you should be disoriented. The saints' lives shock, and they should. . . .
You are called to be a saint, too. What will your poem be? As I have mentioned before, my boys really struggle with writing, which is fairly common with those on the autism spectrum (Son #1 is officially diagnosed with Aspergers; Son #2 has many of the same traits). Several years ago, our homeschooling group held a co-op class using materials from the Institute for Excellence in Writing. Taught by a wonderful woman who has since moved on from homeschooling to teach in a public school, the students thrived. Parents with older children who had been through the program have sung its praises for years. Desperate, I decided to give it a try with my own children. Last spring, I purchased the Middle School Intensive Materials and figured we would give it a shot this year. In a discussion during one of our Friday morning homeschool group meetings, I mentioned this. Before I knew it, I was teaching a co-op class to 8 high-energy boys ranging in age from 11 - 13, who with a couple of notable exceptions, viewed writing with about as much relish as visiting the dentist. With the help of another brave Mom and a daily prayer for the success of this class, I nervously took on the challenge. I've known most of these boys since they were in first or second grade. They are now nearly as tall as me (or taller) and have much deeper voices. They each go to the beat of his own drummer and have never really learned the art of raising one's hand to speak. Needless to say, class was anything but dull. I tried to approach each class with my sense of humor firmly in place. We began a trial run with the original materials I had purchased. At the end of eight weeks, despite the chaos, it was obvious the kids were learning. We decided to keep going with the Middle School Continuation Course which was purchased by our homeschool group. We just finished up last Thursday. I can definitely say that the program works. It provides a very straight-forward rule-based process for writing. Over the course of the year, we covered taking notes, outlining, fiction writing, essay writing, letter writing and critiques. There was something to be said for shared pain. These students, who never would have done this for their individual moms (my children included), were willing to do the work for a class, even though they weren't getting a grade. I would correct their papers and give them encouragement and suggestions on ways to improve and that was it. The goal was simply to improve these middle-schoolers' writing ability. I did adjust the course a bit for the particular audience I was facing. We skipped a couple assignments and did a lot of papers about super heroes and video games. It didn't matter. The point was they were writing, which for some of the students was just short of miraculous. They gained some confidence in their writing abilities and will hopefully continue to improve. In the end, we all survived - the teachers included! Are you a homeschooler who needs to create a portfolio for end of year reporting? Do you have a student starting high school and are wondering how to record high school work in order to create a transcript that colleges or future employers will recognize? Do you have a student who is almost done high school and are panic-stricken because college applications are due and you have no idea how to create a transcript? If you answered "yes" to any of those questions, The Homeschooler's Guide to Portfolios and Transcripts by Loretta Heuer, M.Ed. is the book for you. Heuer is a former classroom teacher who homeschooled her two sons from pre-school through high school. She has been the legislative liason and electronic information coordinator for the Massachusetts Home Learning Association and has spoken widely on the portfolio/transcript process. 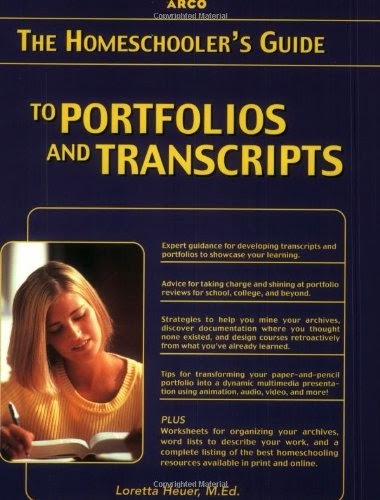 In this book, Heuer describes the differences between portfolios and transcripts and when each is appropriate. She provides step-by-step instructions on how to collect artifacts and documentation as well as how to organize them. She also provides instruction for those whose homeschool experience has been more unconventional, such as unschoolers. This book was written in 2000, so some of the information on technology is a bit dated. No one will be submitting a video on VHS tape. However, many of the ideas can be adapted to up-to-date technological offerings. Overall, it is an excellent guide for any homeschooler needing help with providing documentation of the homeschool experience. 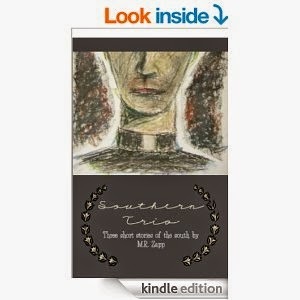 I was pleasantly surprised by Southern Trio: Three Short Stories of the South by M.R. Zapp, a member of The Catholic Writers Guild. These three short works of Catholic fiction are perfect for when one is searching for a quick burst of literary exploration. Kentucky Derby Mama centers on the relationship of a teen daughter with her alcoholic mother. Out from Under features a stuttering teen boy living in a trailer park wondering how he might ever escape. The Magnolia Bloomed is about a priest struggling with his vocation. Despite the brevity of these works, Zapp has been able to develop the main characters quite well and provide a snapshot of their lives at a crisis point. They are worth reading and thinking about. May is a month dedicated to our Blessed Mother. While anytime is a good time to pray a rosary, this month is an especially good time to discover or rediscover this meditative practice. CatholicTV offers a series of videos to help in this endeavor. Please check them out at http://www.catholictv.com/shows/the-rosary. The Rosary is a prayer for the home, and a prayer for the road. It is a prayer that builds community and also one that propels us on our journey. It is a prayer that is both contemplative and active. It is a prayer for the journey that will hopefully carry us to heaven and glory; it is a prayer of those who travel; a prayer of pilgrims . A Pretty Age tells the intertwined story of two young women living in Kansas in 1910. When the book opens, best friends Sophiny Mumm and Antoinette Dominguez are students at a Catholic boarding school when a handsome missionary, Brother Claude, arrives from Brazil and quickly captures the young girls' imaginations. Meanwhile, Antoinette, whose father has died and whose mother has stopped communicating with her, confides in her friend her plans to elope. She begins to act very strangely and has the two of them begin to trade identities. She also has them ostensibly end their friendship so that no one will question Sophiny when she disappears in the dead of night. After Antoinette leaves in a veil of mystery, Sophiny's own mother dies and she must return home to care for her brothers. At this point, her quest for her missing friend begins in earnest and it quickly becomes evident that all is not what it seems. A Pretty Age is a compelling mystery with a subtext of exploring young women's roles in the early 1900s. It makes for very interesting reading. I've been in a long-term battle with "stuff" for quite a while now. A few years back, I did a 40 bags in 40 days project for Lent, removing 40 bags of unnecessary items from my home during that time. In the years since, I've tried to do 40 bags during the course of the year. Last year, I only hit 20. This year, however, I'm up to 25 and I just bought a Bagster so that I can get rid of all the junk that is sitting in the storage area of my basement because it is too big to fit in our city-issued trash barrel and is no good to anybody else. So, I would say my chances of hitting 40 bags this year are very good. Overall, however, I've been trying to live a need-based existence, both out of financial necessity and because the books we've been reading in the Bible Study I belong to have all been encouraging a life in which one embraces poverty (not destitution - there is a difference!) in order to be able to share what you have more freely, whether that sharing be with your Church, family members who are going through a tough time, or people who are starving in your community or around the world. Indulging an occasional want isn't a bad thing. For example, while I sometimes give up chocolate for a time as a temporary fast, I definitely prefer life with it and will happily indulge that want. But, the chocolate isn't taking up long-term residence in my home. I eat it and enjoy it and it is gone. Our relationship with the more permanent stuff can be much more complicated. What do we need in our lives? What do we have that we can do without? What do we have that someone else could make better use of? What comes into our lives is not really ours; it's just ours to take care of for a certain amount of time. Even our children who were born out of our own bodies will grow up and live on without us. Does this perspective change your attachment to the things in your life? Attachment is where problems occur. Our needs control us. When you can't live without something, you've lost control over that thing, and it now controls you. Is it worth sacrificing your freedom to an object? Isn't an object meant to serve you instead of you serving it? Recognize that things come in and out of our lives every day. They rarely start with us and rarely end with us. You have a temporary amount of time with them. So what do we do with these things? Enjoy them, preserve them, appreciate them, or improve them. After you've done one or all of these things, pass them on to someone else who will do the same. Don't let the things you hold onto hold you back. We are simply guardians of history, preserving and advancing what has come into our lives - knowledge and possessions alike. We make a difference with every seedling we nurture, table we restore, helpful tip we share, and heirloom we carefully pass on to the next generation. 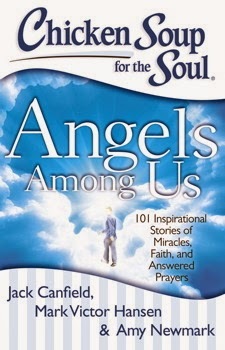 The Chicken Soup for the Soul Series is known for its heart-wrenching and uplifting stories and this installment, Angels Among Us, is no exception. For the purposes of this book, an "angel" is any unexplained person or being who comes to help - be it someone who has died, an animal, or the higher-order beings we usually refer to as angels. I enjoy reading stories about angels as evidence that God is with us. I firmly believe that we each have a guardian angel, or perhaps a team of them, who watch over us. While, to my knowledge, I have never seen my own with my eyes, I have certainly had experiences where I'm confident my angel has intervened. The individuals who share their stories in these pages have had lost items returned to them by people who did not have their name or address, been driven by a bus driver not known by the bus company on a bus route that did not exist, experienced the peace of God by a tangible reminder after the loss of a child, been miraculously healed by a stranger, and have experienced visits and warnings from loved ones who have crossed the veil into eternity. I do not know why God intervenes in some cases and not in others, but these stories are reminders that we are not alone as we make our way through this life. With 101 stories, this is a great book to read a couple of stories at a time when one needs to be uplifted. 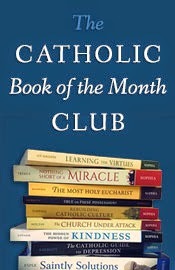 Sophia Institute Press has started a new Catholic Book-of-the-Month Club. For $15 per month, they will send you one of their new releases with free shipping.